If you're planning a trip to visit this park/garden, it's all worth it. 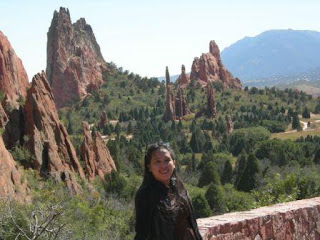 There's really a big difference when nature calls...the beauty is mesmerizing seeing the giant red rocks formed. There is so much to learn with the rocks. 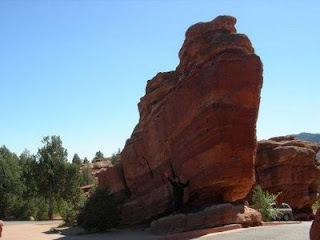 You can go further inside the park by driving seeing all those various forms of big rocks along the way. Then, you'll gonna see the beauty of the whole garden as well viewing from the side of the road. You can further take a by foot tour in the garden. It needs a lot of walking, so be prepared to wear a comfortable shoes and necessary clothing protection depending on the weather. We were there last fall, and it was kinda chilly and sunny. If you love shopping, you can drop by at the gift shop for souvenirs at the Visitor and Nature Center gift shop. Have fun! 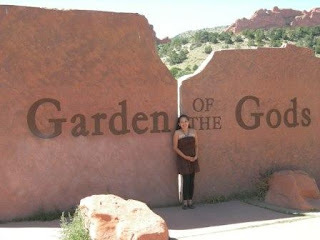 Visit Garden of the Gods website. These are great pictures. One of the places I would like to visit in the states too, (someday) are the famous fountains of Wyoming. Thanks for sharing your adventures...keep posting and happy blogging.